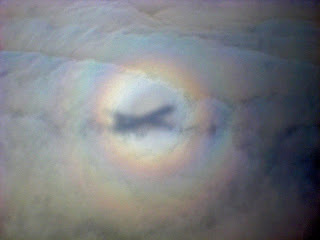 This fantastic picture of a glory surround ing the shadow of an aircraft comes from reader Tony Travaglia, taken on his trip home to New Zealand after his WA adventure. On the morning of Thursday 25 September the Moon will pass in front of the Beehive cluster. The event starts around 4:30 am in the morning, with the Moon low on the north-eastern horizon. At 5:30 the Moon will be half-way across the Beehive, but dawn will interfere with viewing after this. This event is best viewed in binoculars or a small telescope. So Sunday comes around. Despite the fact that this rotten cold thing has kept me from training, I bravely leap stagger out of bed, don my groovy Faculty T-shirt and the slinky running shorts the family got me for Fathers day and drive off to the spot where the Faculty 6 Km'ers will meet. The Brain Foundation needs me! It turns out that there are only 3 6 Km'ers from the Faculty, everyone else is doing 12 Km. Also, it's a bracing 8 degrees, so I can pass the time till the start by counting goosebumps. But the sky is cloudless and the gentle breeze will be behind us. Perfect conditions. The race marshals get us to line up next to signs which represent the times we think we will run. I go stand around the 42 minute mark (being somewhat optimistic). Applause bursts out, the wheelchair racers zoom past, then the first of the 12Km runners. The marshals get us ready to go. A group of runners dressed as smurfs go past, then the 6 Km runners are OFF! We shuffle out the gate and start getting up to speed. Well, other people do. I continue shuffling. The sun is warm on me, and people pass me by... and pass me by... and pass me by.. The landmarks are familiar from last year, when I did the 6 Km as a walk, the 1 Km marker drifts past. By now I should be getting into a rhythm, warming up and getting a bit of pace. But no, I'm still slogging along, not exactly shuffling any more, but not gliding effortlessly. Despite not firing on all cylinders, I seem to be doing better than when I walked last year. Maybe because walking takes longer, the fact that last years landmarks appear to be zooming by may be making me feel better. At the first water spot there is a lot of congestion, and I have to stop running to get water, losing time. I slog up to speed again, a band plays Dixieland jazz, not the sort of thing you need to get a good running groove on. I try to play Ramones songs in my head to get into a speed frame of mind, but all that comes up is Pink Floyds "Wish You Were Here". This is not a song to help you run at speed. Where is that blinking distance marker!!!! It finally materializes. People applaud us and call encouragement was we go by. People pass me. A Zebra passes me. Oh wait, I'm not hallucinating, it's someone dressed as a Zebra. Will this never end? I see the final turn ahead. I try speeding up a bit, but my lungs are making sounds like a blocked drain, and my legs refuse to go any faster. People keep passing me. But now I am passing other people. The finish line looms, can I keep it up? Yes! Under the banner and crash to a halt as we line up to have our times electronically recorded. The Dean passes me in the line and asks how I went. I say "wurgle wugrle glump". Hmm, promotion seems further away after that brilliant piece of repartee. Collecting a bright blue drink that tastes like sugared sweat, and a free newspaper, I go collapse on the grass. According to me I did the run in 41 minutes 3 seconds, not bad considering I was running around 45 minutes per 6 Km in training. Later the official results will say I ran 6Km in 40 minutes 13 seconds. Mobile phones make lousy stop watches. Surprisingly, my legs don't hurt. My lungs feel like sponges soaked in glue, but my legs are okay. And I raised some money for charity too! (Many thanks to all the donors, you know who you are) Woot! 12 Km next year! 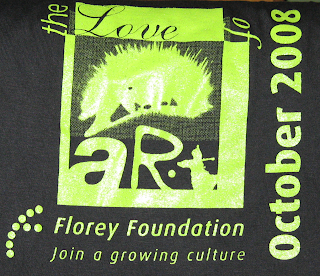 I now have my T-Shirt, and I am ready to run. As I have mentioned before, I am entering the City to Bay fun run. This year, ratcheting things up a notch, I'm going to run a whole 6 kilometres (Whoooo!!!). Yeah, 6 kilometres. I used to run marathons 20 years ago, now 6 kilometres is a big deal. Still, besides having fun and getting marginally fitter, this year I thought I would do some good, so I've signed up to be an everyday hero. I'm raising money for the Brain Foundation, good folks who have funded my research and support community programmes and preventative work for brain disease and brain injury. I have personally seen the lives touched by these folks (no, not my research), so if you have a bit of spare cash please visit my fund raising website at Everyday Heros. Of course, I have been training, and my family have bought me hhi-teck running shorts, but I have come down with a cold or something, so my training schedule is shot. Looks like I will still be wheezing and choughing to the end. The forth of a free, six part lecture series free public seminars on climate change being given at Adelaide University. The seminar "Are the impacts of climate change being overstated?" will be from 5:30pm to 7:00pm, Friday 19 September, Lecture Theatre 102, Napier Building, North Terrace Campus, University of Adelaide. 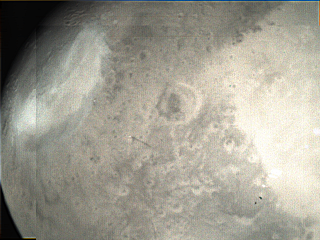 Over at the ESA's Mars VMC webcam site, the most recent images show the most impressive volcanoes of Mars. 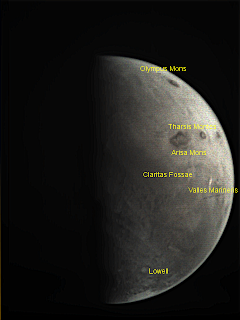 Olympus Mons right on the edge near the top, and Tharsis Montes complex (Arisa Mons, Pavonis Mons and Ascraeus Mons) near the middle edge. Click on the image to enlarge it. There is a 3D image below this, and a GIF animation here. 3D image of Mars. 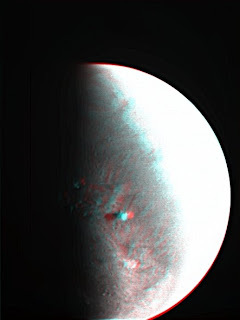 It's a red-blue anaglyph, so you will need those red-blue glasses to see it in 3D. Click on the image to enlarge it. The Planetary dance continues. Here Venus, Mercury and Spica make a triangle, with Mars seen dimly below (Venus is the brightest, Mercury to the left of it and Spica above, as always click to enlarge). Over the next few days Venus will rise higher and come close to Spica, forming a line with Mercury. For earlier images in the series see here, here, and here. On Saturday Venus and Mars came really close (this image is from around 7:00 pm local time). Venus is the bright one, Mars is the dim dot just to the side of Venus, up and to the left is Mercury and right near the top is the star Spica. Carnival of Space #70 is here. Carnival of Space #70 is now up at Orbital Hub. There is the Space Shuttle, ESA's Mars Express, Simulated solar sailing, the Phoenix lander, tough water bears and much much more. Boost yourself over for a read right now. Here's a quick and dirty play around with some of the Mars Express VMVC images. I've used Gordan Ugarković's colour converter to extract colour PNG images from the RAW files, then used Registax to sharpen the images, and GIMP to overlay two images. The planetary Dance continues, Venus (brightest object bottom right) is moving up towards Mars (the dim object nearby), and tomorrow and the next night they will form a line with Mercury (the next brightest object nearby). Mars and Venus will be less than 30 arc minutes (about half a finger width) apart. 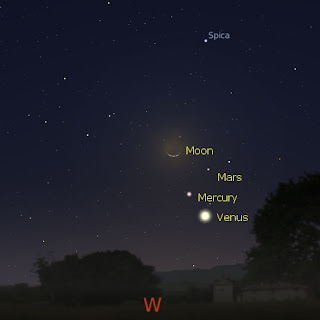 After this encounter Mercury and Venus will climb towards Spica (the bright object near the top of the image). As always, click on the image to enlarge it. I managed to see Jupiter 45 minutes before sunset today, 15 minutes before the supposed theoretical limit. True, I cheated. I was using the Moon as my guide as before, but I used binoculars to locate Jupiter near the Moon. Even then I found it hard, actually nigh impossible, to see Jupiter without binoculars. However, small clouds were coming across the sky, and when i could relate Jupiter to the edge of these clouds, I could immediately see Jupiter "pop" out, next to the cloud. Once I had Jupiter in my sight, it was fairly easy to see. This must say something intteresting about my visual sytem (maybe all human visual systems), that when Jupiter is alone in a wide swathe of blue I can't see it, but as soon as there is a reference object nearby, like a cloud, it becomes obvious. Now, how much further into the day can i go. I may have to wait for next month, when Jupitr is much closer to the Moon. At the Soccer Photos this evening, a shower of rain threatened the shoot, but then a beautiful double rainbow emerged, the rain stopped, and my soccer team had their photos taken. Following on from my post about seeing Jupiter 11 minutes before sunset, I was able to see Jupiter 30 minutes before sunset, with the Sun 5 degrees above the horizon. As I noted in my previous post, I found an article from 1917 that says you can see Jupiter only when the Sun is 5 degrees or less above the horizon, so theoretically this is the limit for seeing Jupiter. However, Jupiter looked failry obvious, so I might be able to see it earlier. I used the Moon as my guide to locate Jupiter, but I until 30 minutes before sunset I was actually looking in the wrong place. I had to check the sky charts again before I realised that I was looking too far to the right. I'll try and have a go tomorrow, again using the Moon as reference, and see if I can see it earlier than 30 minutes. 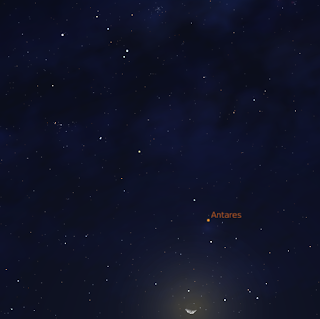 Also saw Antatres in binoculars on Sunday, just on sunset, again using the Moon as my guide. Again, If I hadn't been looking in slighly the wrong place, I think I could have seen Antares earlier. This comic sums it up. I have the best family ever. It was Father's day here in Australia, and my family surprised me with a fantastic set of running shorts (they made me feel as if I was running faster just wearing them) that will be of great help when I run the city to bay (I'm trying to raise money for the Brain Foundation with my run). And they got me a new digital camera. Gobsmacked, surprised, astounded and deeply loved is how I could describe myself (okay, so a camera is a very materialistic thing, but the fact that they decied to support my photography habit, when they could have bought other things instead shows they really care. EldestOne now has to curb his refexive "Not MORE photos dad!"). Also, the hand-painted mug and the laboriously made cards (MiddleOne did an origami card, and SmallestOne made a figure out of nuts and bolts) were pretty good too. Anyway the camera is a Canon IXUS 90IS, with digital macro and zoom, so I can pursue my quest for small things and large. There is a bweildering variety of setting, and I spent a large chunk of this evening playing with them (this afternoon MiddleOne and I were assembling a pop-up Starwars walker). This image of Crux was taken at ISO 200 with a 6 second exposure. Click to enlarge and you can see the Jewel Box cluster, on the original you can also see Omega Centauri. The little dots near the brightest stars are artefacts, possibly due to wobble in the tripod. This was more pronounced at ISO 400. I have to see if I can eliminate this through longer exposure delay. The image below is the Line up, Mars, Mercury, Venus and gamma Virginis at ISO 80 and 6 seconds exposure (click to enlarge). This camera is so cool! I'm going to have lots of fun with it! The Rosetta Spacecraft has successfully flown by Asteroid Steins. See the flyby article here, the Rosetta blog, and this nice animation of the flyby. Currently: cloud. Going to watch Zathura with the family. UPDATE: 8:25 pm. Clouding getting thicker "your robot is defective". Best.line.ever. UPDATE: 9:10 pm. Clouds completely blot out all light from Moon. Giving up. Zathura is great! Still more Mars VMC camera animations: High cloud! Over at the Mars Express VMC camera site, they have images of an "unknown artefact". I'm pretty sure the artefact is a cloud, with its shadow. In the 3 D image to the left it's pretty clear that the object is much higher than the surface (click to enlarge). In this animated gif, you can see the cloud drift away from a group of 3 craters (use a line drawn from the bottom crater to the nearby peak as a reference), and its shadow grows smaller as the sun rises. 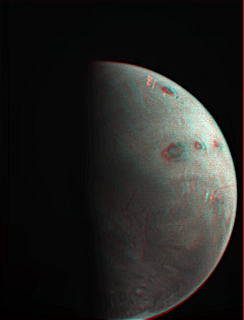 Also have a look at this colour composite of Mars created by Ted Stryk, pretty amazing, and Mike Malaska has a great animation of clouds near the terminator. You can see detailed descriptions of how I made these images here. UPDATE: My images have been posted at the VMC website, along with Gordan Ugarković's great colour images. Carnival of Space #69 is here. Carnival of Space #69, the Universe from A-Z is now up at Discover News (Space). As the title suggests, it is alphabetically themed this week. There's aliens, Mars rovers, Space tourism, dark matter and green objects in space. Start humming the alphabet song and skip on over. The constellation Scorpius, as seen from Adelaide at 9:oo pm local time on Saturday 6 September 2008, just before the Moon covers 2 Scorpii (click to enlarge). In the early evening of Saturday September 6 the dark side of the Moon passes over the star 2 Scorpii (around 9:45 pm in eastern states, 9:00 pm central states, 7:00 pm WA, in Darwin the Moon passes over similarly bright 1 Scorpii instead at 7:35 pm). A more detailed timetable is here. This event can be easily seen in binoculars, and the early evening time makes it accessible to most people. Seeing the occultation with the unaided eye may be a bit of a stretch under suburban skies. The Moon also passes over the dimmer 3 Scorpii shortly after 2 Scorpii. This is definitely a binocular or small telescope sight. Whether you observe by eye, binoculars or telescope, the sight of the waxing Moon in the head of the constellation Scorpius will be rather beautiful. Keep an eye out for the International Space Station as well. The third of a free, six part lecture series free public seminars on climate change being given at Adelaide University. The seminar "What future climate change scenarios are possible??" will be from 5:30pm to 7:00pm, Friday 5 September, Lecture Theatre 102, Napier Building, North Terrace Campus, University of Adelaide. 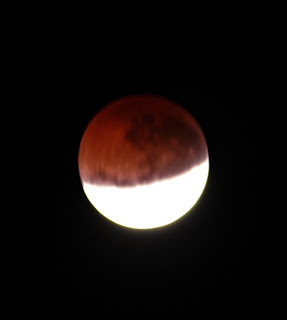 Tony Travaglia of Otago, New Zealand, was holidaying in Western Australia during the Lunar eclipse of 17 August. He's back now, and has sent these lovely images of the eclipse. Tony saw the eclipse from Walan WA and wrote that he felth that the the "orange moon" was not quite up to his usual standard as it was hand held resting upon the roof of a car with no tripod. Heck, the colours are beautiful, tripod or no tripod. Great work Tony. The images were taken with a 400mm lens Canon L series 5.6. Tony also took an image of the "glory" which I will post later. 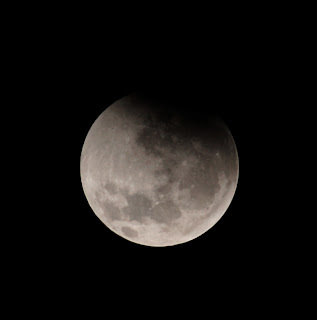 For now, enjoy these Lunar eclipse images (As always, click to enlarge). This magnificent image of the 2 September planetary lineup is from Chris Wyatt of Bendigo. 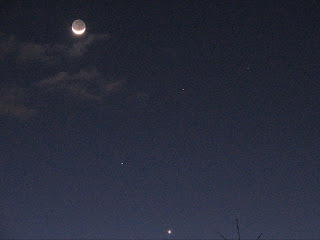 Taken at 6:52 pm local time on September 2, it shows the Moon with the planets Mars, Mercury and Venus. Like me, he had clouds early on, but they cleared at sunset. But come out they did, inconveniently during dinner of course, but I made a nice little animation of them setting above the neighbours house. By the time I did this of course, all the interesting clouds had gone, so the animation looks a little flat. Keep you eye on the western horizon over the next few days as Mars, Venus and Mercury come closer together. Southern Skywatch September 2008 Edition now up. Western horizon, an hour after sunset as seen from the southern hemisphere on September 2. The September edition of Southern Skywatch is now up. There is more planetary hi-jinks, a nice occultation or two and comet A1 McNaught. Enjoy!